In this chapter, we describe a number of techniques of applied mathematics. Some may already be familiar to you. All will play a role in subsequent discussions ofvalue-at-risk. This opening section places them in that context. Recall Section 1.8, which described a framework for modelingvalue-at-risk. 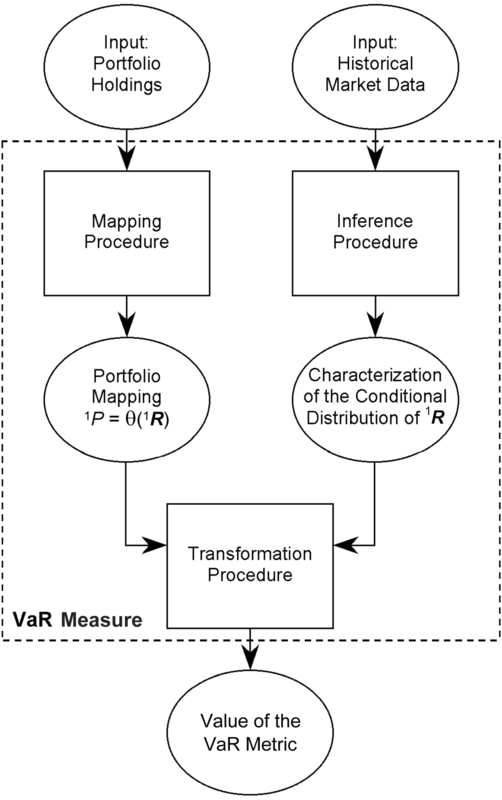 It includes a general schematic describing value-at-risk measures, which we reproduce in Exhibit 2.1. Exhibit 2.1: A reproduction of Exhibit 1.12, which is a general schematic for value-at-risk measures. The techniques of applied mathematics described in this chapter are employed throughout the remainder of the book. They are especially important for discussions of mapping procedures in Chapter 9 and transformation procedures in Chapter 10. Principal component analysis offers another technique of approximation. It is probabilistic, so we discuss it in Chapter 3. The present chapter covers eigenvalues and eigenvectors, which anticipate that discussion. We considered Monte Carlo transformations in Section 1.6. That discussion was largely intuitive. To apply variance reduction techniques within Monte Carlo transformations, we will need a more formal understanding of the Monte Carlo method . That more formal understanding will come in the context of numerical integration. In anticipation of that discussion, the present chapter discusses the famous change-of-variables formula for definite integrals as well as deterministic techniques of numerical integration in one and multiple dimensions. One of those techniques—the trapezoidal rule—will be employed with quadratic transformations in Chapter 10. Newton’s method, which is a practical tool for solving nonlinear equations.